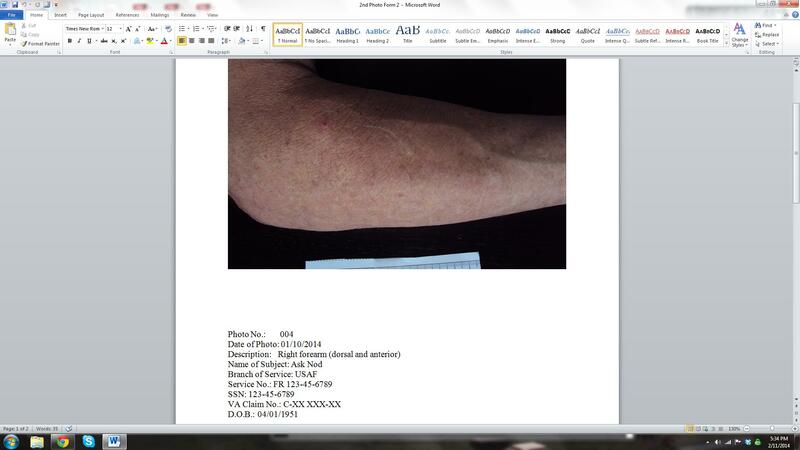 Many Veterans have contacted me about submitting photo evidence and what constitutes an acceptable form by VA. Our resident dermatologist, Jules, and proud recent member of the 100% P&T club here has clued me in to the requirements. My attorney extraordinaire, Bob “I make it rain” Walsh even proffered me a form. I hereby share it with all of you. Now follow me on this. 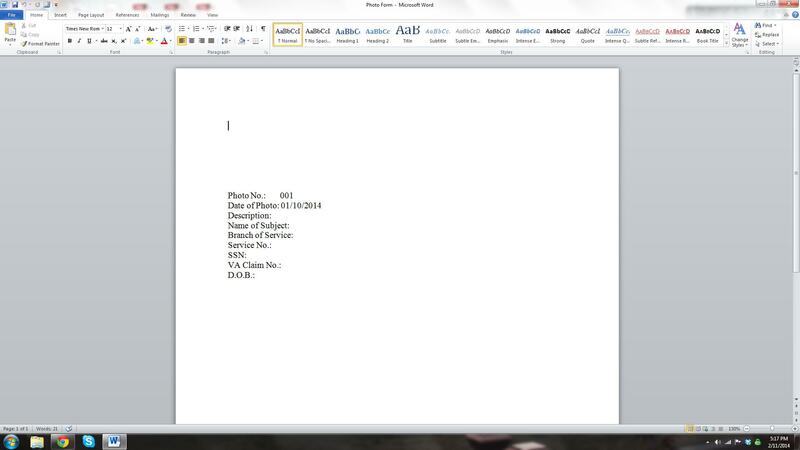 First, it’s a “live round” Microsoft word doc. It’s ready to modify in it’s current state. I left a static date in the correct format in place to show how it looks ( 01/10/2014). You can change it. Hit “enable editing” in the top yellow bar and you’re live. Now, this is easy. Here’s a screenshot for all of you. Click on it once to magnify. Place your cursor at the top left like the one in the picture below and then go to the top with the mouse monkey. I call the thing that follows your mouse…nevermind. Up in the top left on M/S Word is the action bar for insert next to home. Click on insert and choose “picture” down and to the right below it. This opens another menu of your computer to choose either a picture from your albums or something you have saved and are ready to insert into the Microsoft Photo file. Next, while poised on the item/picture of your choice, illuminate it by left clicking on it once. Next, return to the bottom of the window and click save. Fill in the block below and add in the appropriate info as necessary. I’ll screenshoot another finished copy example for you. Next, if you are satisfied with the finished product, you want to protect it against tampering by anyone at the VA. Think of it as helping them to keep themselves honest. Move your mouse monkey up to the FILE tab in the upper left where the insert and home tabs are and click it. Choose SAVE AS. When the next window opens to save it on your computer, I put them on the desktop because I never can find them if I blindly hit okay. It’s like socks to the washing machine. First, name it where it says File name. I like to use Ask Joe Nod, 004 Right Arm . Just below it, it asks what file format you would like to save it in. It says Save as type. Click on that bar and a menu drops down. Choose PDF. This pours cement around it and it stays put more or less in this form. It’s a smaller file size than a ,jpg, .tif or .png file and will upload to eBenefits more easily if you should choose to take that risky path. Last, but not least, go to the bottom right and click SAVE. 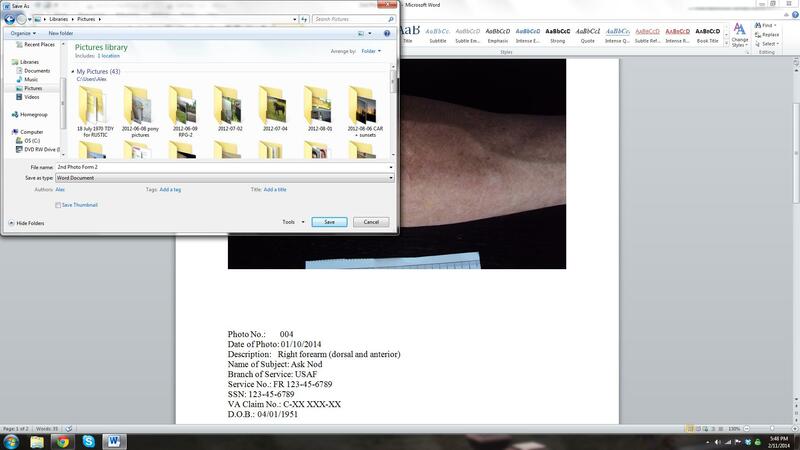 Once it’s saved you can open a new file, name it and put all the .PDFs in it. When you need it you can print them up to send in to rebut the denial. But we know you guys and gals are red hot and win them all at the VARO nearest you. This is just one more way to hit one out of the Veterans Service Center when you first come to bat. Now we’re going to go the extra step that will professionalize the production. Here’s the download to a free ruler you can print. It is accurate. Even though we live in America, dermatologists live in centimeterland- east of the Land of Nod. A Stanley 30-foot metal construction tape is right out. Cut off about 5 cm. of your free new cm. ruler and write your full name, rank and airspeed on it including the date. This is a must have. Every picture must have one and adjacent to what it is you are trying so desperately to draw the rater’s absent-minded attention to. You can see the top edge of the one in the picture above. I cropped it out. This will help you win your claims. VA will try anything to toss the evidence out or claim they cannot decipher it because it does not conform. What they won’t tell you precisely is what it was that made the picture inadmissible. This format is VA-bulletproof. Of note, this conforms all the way up when they demand stricter protocols for evidence in the Record Before the Agency (RBA) or above (Record of Proceedings or ROP). This entry was posted in Nexus Information, Tips and Tricks and tagged ASKNOD BOOK, asknod.org, asknod@wordpress.com, Disabled Veteran, DIY vA Claims, Gulf War Claims Help, Gulf War Vets Help, Helping Veterans, Photo evidence in VA claims, Service Connection, Submitting photos to VA, VA claims, Veterans claims help, Vietnam Veterans Claims Help.. Bookmark the permalink. 363 days in and I’m told the claim is still in the development case. Thanks, A, for all you do. Susan? Where the hell did that come from? Anyway, it has his name and social security number and date. Karen, I suggest you resubmit if you’ve sent the others in already. If it goes to appeal, they will have a field day with it. Not trying to pop the balloon. I’m trying to keep your balloons inflated. I just photocopied pics with name and Susan at the bottom! And VA can legally choose to toss it in the circular file as “non-conforming” or “does not identify subject.” I have a list of several other often-used reasons.